The year is 1938. In the dull light of a basement apartment in the town of Drohobycz a man is anxiously penning a letter to his literary hero Thomas Mann. He works at a desk that is too low for him. When he is disturbed and distressed by the sound of birds pecking at the high windows he slips down onto the floor and continues working there until the falling autumn light forces him back up to the desk. 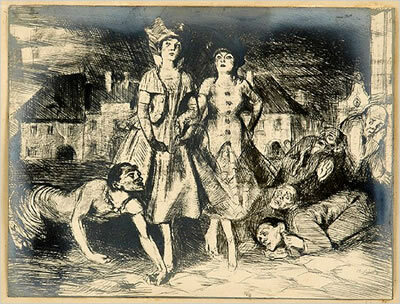 On the walls of his room hang drawings he has made – fantastic dark sketches of domineering women and desperate men. 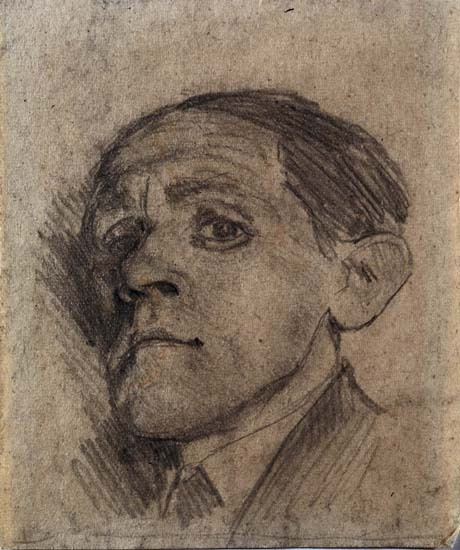 The man is famed Polish writer and artist Bruno Schulz. As he composes his missive to Dr Mann, German author Maxim Biller is conducting a guided tour to the interior thoughts, fantasies and fears – make that Fear with a capital F – that he imagines fueling Schulz’s surreal and creative imagination. The resulting novella, Inside the Head of Bruno Schulz serves as a delightfully inventive introduction to an original and influential writer. Biller paints a portrait of a deeply anxious man… a character that would be at home in one of Schulz’s own stories. When he meet him he is unsuccessfully struggling with a novel. He lives with his sister and her two sons. She still believes her dead husband will return. His students whom he thinks of as “bird-brained” literally appear to him as birds, at his window and in his room. He has a conflicted affection for a sado-masochistic sports and philosophy teacher whom he describes as beautiful despite her hairy monkey face and filthy matted hair. But more critically, he carries an impending sense of doom as it increasingly seems inevitable that Germany will be moving toward Poland. It is with that in mind that he is writing to Thomas Mann. A most curious and twisted fellow claiming to be the great writer has turned up in this small town, charming the residents with enticing stories and grotesque gatherings. The fictional Bruno is anxious to alert Dr Mann to the existence of this impostor whom he suspects is actually a Nazi spy, and to beseech him to consider offering a poor Polish writer critical assistance. With an opportunity to publish in a prestigious journal or an introduction to an important publisher, the timid Bruno believes he might find the courage to leave Poland. He has even written a story in German to include with his appeal. Bruno Schulz was a Polish-Jewish writer born in 1892 in Drohobycz, a town historically part of the kingdom of Poland, now part of the Ukraine. During his lifetime he published two collections of short stories, The Street of Crocodiles and Sanatorium Under the Sign of the Hourglass. He was known to be at work on a novel, The Messiah, which has not survived. He worked as an artist and an art teacher for many years. When the Germans moved into Poland during the Second World War, his artwork granted him temporary protection under the auspices of an admiring Gestapo officer in exchange for the painting a mural in the officer’s home. On November 19, 1942, walking home with a loaf of bread, he was shot in the back of the head by another Gestapo officer, a rival of his protector. He was 50 years-old. 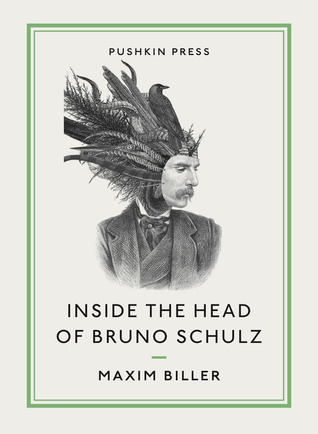 Published by Pushkin Press (April, 2015 in the UK/October 2015 in North America), Inside the Head of Bruno Schulz is translated from the German by Anthea Bell. The stories “Birds” and “Cinnamon Shops” from The Street of Crocodiles, were translated from the Polish by Celina Wieniewska and originally published 1963. This sounds fascinating. I love that quote you use. I think I may have The Street of Crocodiles, I must check it out. It is fascinating how influential Schulz has been even if he never left his hometown and had his life tragically cut short. This book was a great introduction and I want to track down Street of Crocodiles myself. I have almost bought this on a couple of occasions based on the title and cover alone – your review has convinced me! Sadly, I’ve not read Bruno Schulz either and must also put that right. It is wonderful… lately I feel like I am discovering so many exciting European writers from the twentieth century that i wish I had discovered earlier. This one has been on my TBR pile for a while now. Great review! It has made me want to read it soon! It is great fun and a quick read too. I read this for Shiny New Books and loved it – particularly as I had read Schulz’s work not that long ago. He’s quite unique and I thought this book captured him brilliantly. It does work a fair amount of biographical background into the story it seems but in a magical way. I definitely want to read more Schulz. I am also curious about Cynthia Ozick’s novel The Messiah of Stockholm about a man who is convinced he is Bruno’s son and in the possession of the missing novel. Ooh! I hadn’t heard of the Ozick book – I’ll look out for it! Like Grant, I have toyed with the idea of buying this based on the cover image. Plus Pushkin are a tried and trusted publisher – whoever picks their books is doing a fine job. Thanks for a very intriguing review! I am so thrilled to have “met” Bruno Schulz through this book. I did not really know what to expect at the outset. It sounds like Being John Malkovich only Bruno Schulz instead. I read Street of Crocodiles a few years ago and loved it. Bet I would like this book too! BS has been on my tbr radar for some while now, and I very much like the sound of this novella, too. Thanks for bringing it to my attention. You’re welcome, it is a wonderful way to meet Schulz.